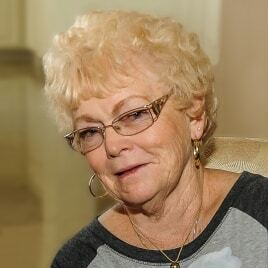 Joan Brewer made a remarkable recovery after heart failure in Dec but it was a stroke that suddenly took her life on Aug. 29, 2016 at the age of 80. She is survived by her long time companion Jimmie F. Spence, her daughters Linda Klipp (Bill), Julie Barker (Rob) and Sheri Birkmaier, her Grandson’s Benjamin Gallagher (Carolyn) and Brandon Techau, her Granddaughters Lauren Allen (David), Brittany Klipp, Lyndsey Barker, Lauren Barker, Isabella Barker and her Great Granddaughters Zoe, Keira, Charlotte, Melia and Hailey. She is preceded in death by her parents, her son Steve Lundstrom and baby Diane. She was born on Dec. 30th, 1935 to parents Beryl and Elaine Oates in McGregor, IA but moved as a young girl to California. She attended Catholic school while growing up the Los Angeles, CA. area before moving to Northern CA. in early 1960 to raise her family. She worked in the electronics industry as a quality control inspector before retiring in Brentwood, CA 16 years ago. She continued to work at Hallmark cards and volunteer as an elections supervisor. She had an incredible work ethic often being praised by her employers. In her leisure she enjoyed gardening, walking her dogs, going to movies, antique hunting and spending time with her children, grand children and great grand children. She was a social butterfly making friends wherever she went whether socializing with the local Red Hat group or around the senior center or going on the Summerset bus trips. In Life, Love and helping others her lust for life and big personality will be surely missed. Safe travels on the other side, we love you. A memorial service is scheduled for Saturday September 24, 2016 at 9:30 a.m. at The Immaculate Heart of Mary Catholic Church, 500 Fairview Avenue, Brentwood, CA 94513. When she was recovering from her heart failure at John Muir in Walnut Creek last Dec. ARF (Animal Rescue Foundation )brought animals to visit and comfort her. She loved having the pets sit on her bed. It really was the highlight of her day. Given her love of animals especially her dogs, we request donations in honor of Joan Brewer, in lieu of flowers be made to ARF Animal Rescue Foundation www.arflife.org/honor or mailed to ARF, 2890 Mitchell Drive, Walnut Creek, CA. 94598. Even though I didn't know Joan, I do know her daughter Linda, and son-in-law Bill, and was with them in Africa when the word came about her sudden stroke and death. It is so awful to receive such devastating news when you are so far away, and there is little you can do. I can only speculate that Linda must have gotten some of the wonderful qualities she has from her mother. Linda is kind, caring, funny, positive, and always fun to be around. From what Linda wrote, it sounds like Joan was like that too. Rest in peace Joan, and I hope you are now reunited with some of your loved ones who preceded you in death, and with the dogs who were waiting for you at the Rainbow Bridge. Healgrief has a memorial to share with you. https://healgrief.org/joan-brewer/ We invite you to express condolences, share special memories and photos and light virtual candles to honor and celebrate the life of our loved one. We also invite you to share this with others who may want to be notified as well. You may do so by sharing the link or by clicking the “Share this Memorial” button from within the memorial itself.